Now that my island table is finished, I'm already on the move getting my next table ready for gaming. Instead of a more natural environment, I've opted for a more traditional, urban setting for my new table. Normally, these tables bore me, so I knew that if I wanted to do it, I had to really come up with a solid idea and theme. When reading about the Ikari, the mentions of Novyy Bangkok really piqued my interest. A slummy, underground hive of black and grey market traders, but with a slight Chinese and Japanese twist really got my imagination going. To start my new table, I picked up the Cold Front terrain from Black Sheep Industries. They provide a solid assortment of shapes, plus shipping containers and towers to work with. Additionally, the guy who runs it is super flexible, and allowed me to buy 6 extra of the bastion upgrades, so that I could really make some interesting shapes with my buildings, and have very few that were only single-story. The shapes are basic, with some minor detailing, so they are a perfect starting point for upgrading with some extra details. 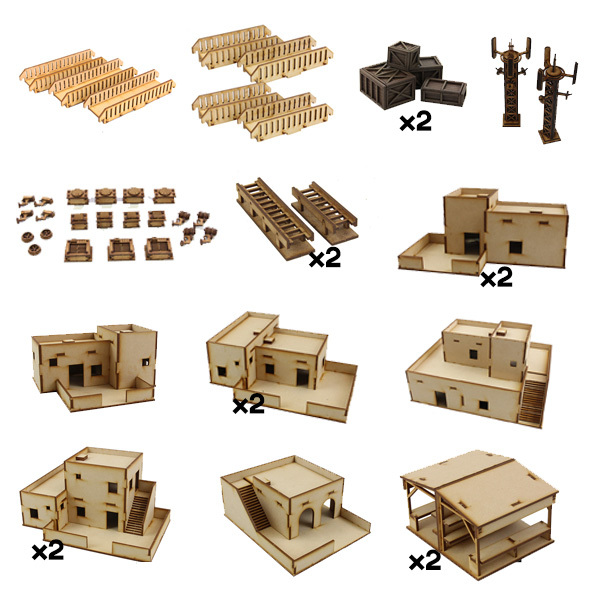 Another, amazing source of terrain to begin the project would have been the Tabula Rasa 4x4 bundle by Knights of Dice, but their shipping to the US is just crazy. Next, I had to find a game mat, no table is complete without a substrate that gets the feeling across that you want. I knew the mat I wanted the moment I saw it, Chem Zone by GameMat.eu. It's industrial, with a bit of a space-station feel with the sub-surface areas peeking through. I won't get into all the random scatter I bought, or a few of my special buildings for flavor (like a Torii arch and shrine), since that's specific to the feel I wanted for this table, but instead, lets talk about how I took some basic, square-ish buildings, and accessorized them to look really unique and fun. 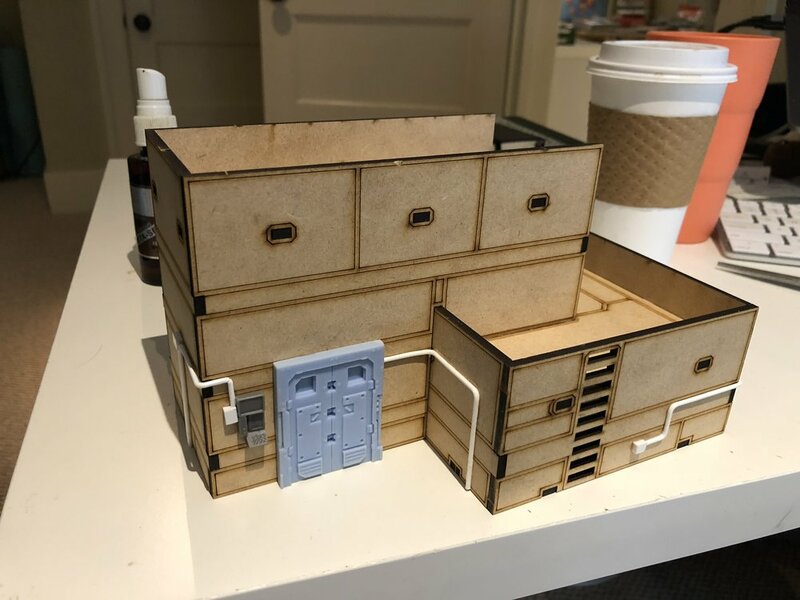 There are two ways to go when detailing terrain, first off, you can buy resin and MDF upgrades from a variety of sources. These are great for doors, lights, control panels, vents and fans, things which are high in detail. 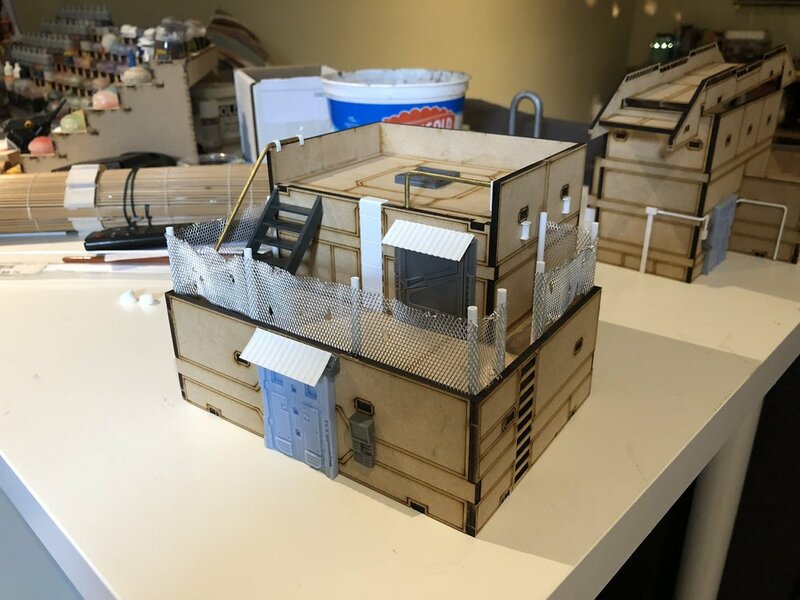 The second method is scratch building, which takes a lot of work, but can be a lot less expensive, and let you do things that you cannot easily find resin bits for, like chain link fences, awnings, cabling, and armored panels. After I got the doors in order, I moved on to adding even more accessories. TTCombat makes some great resin and MDF upgrades, as does Miniature Scenery, Blotz, Antenocitis Workshop, and countless others. This is probably my favorite part. For the weird things that I can't get made in MDF or resin, I look to make myself with plasticard, brass rod, aluminum mesh, and other materials. I'm always on the look out for interesting shapes, industrial beams, hex rod, full, half, and quarter round, plastic, pipes, as well as diamond plate, square grid, and corrugated plastic card to work with. Plastruct and Evergreen Scale Models are the two biggest suppliers, and you can find one, or both at just about any train store (I love train stores). Just a small sampling of my plasticard collection. After you've built yourself a nice collection of odds and ends to make terrain with, it's time to glue the whole mess together! I started off by assembling the rectangular buildings, as well as their second story, which was purposely put off-center so that it would create a more interesting shape to play with. Next was the fun part, accessorizing! For my first building, I wanted it to feel like a run-down habitat or maybe a sketchy office in the industrial part of town. Adding awnings and a fence makes it feel more lived in, someone wants shade over their door, and doesn't want uninvited guests. The fence was simply made with some plastic rods as the posts, with a strip of aluminum mesh for the fencing, then I cut some holes and roughed it up a bit so that it looks well-worn. When I get around to painting, I'll add some "keep out" signs glued to the fence itself. The ladder was covered up with plastic card, since I wanted to add a set of stairs, and brass rod was used to make guard rails for both the stars, and the upper level. The second building, I wanted to be a little bit cleaner, maybe it's a power depot, or small-time manufacturer or various goods. I replaced the old doors with new resin ones, which add a lot to the feel of the building, and used plastic coated steel wire to add some external cables. I'll probably add some of the fans and ducts from TTCombat to the external walls before calling it complete. Altogether on the table, the set of terrain from Black Sheep Industries, plus a few other odd pieces I have in my collection, goes a long way to providing a full table of interesting looking terrain. Once my abandoned shrine is assembled and painted, it'll have a lot more character, sending home the idea that these are once-noble warriors, now engaging in a meager, underground life. You thought I was going to have a boring city table without any special terrain rules, didn't you? Well don't you worry, to enhance this table, I've planned two sources of special terrain to use. The first is a objective room from Every Little War, which I have added a power generator to from Secret Weapon miniatures, it will follow the Generator Room rules for, making it a White Noise and Saturation Zone. Additionally, I have several Field Generators from WarGamma, which are great to represent steam vents from the sub-surface areas of the station, providing areas of smoke. While there isn't any terrain to slow people down, the combination of smoke generating terrain and white noise generating terrain should be interesting.